This past period I re-loaded my Desktop PC to use one of the modern APU from AMD. I went from a powerful Quad-Core system to an APU On-board low power system. I did this out of a conscious choice to start limiting my impact on carbon emission and of course lower my utility bills. I am mostly in browse or Coding mode most of the time, I don’t game at all, so my need for a monster powered system of decades ago, is no more responsible in this green age. I mean, my desktop is like 24hr alive, so this is really necessary. After the re-load, I was faced with two issues immediately. Video Driver issues which I wouldn’t bother you with in this article. I was eventually able to fix it by double installation of Win8. Simply to refresh the system. 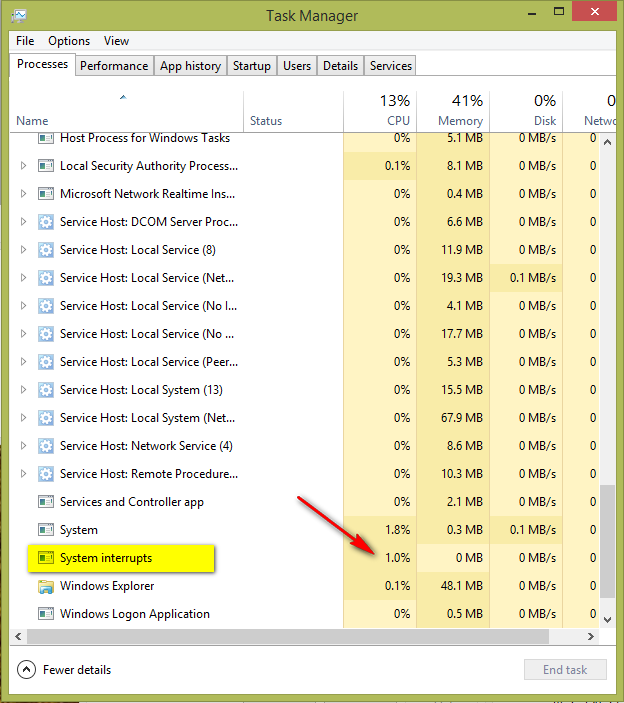 The second and persistent problem was the high CPU usage of the System Interrupts. Mine was running on constant average of 20% which as a Windows expert I know it means trouble in paradise. In the IDE HDD years, you know this means a HDD is using low level mode instead of the DMA mode. But these days, all HDDs use DMA mode, just to be sure, I wanted to check, yup, all my HDDs are on UDMA mode. So what could be causing this headache. High Interrupt use means warm CPU and waste of energy. I scoured the internet for a solution, none are relevant to me. Now there is no tool that I know of that can show you Interrupt CPU usage and from where the break requests are coming from. So I decided something that years of experience has taught me: Defragment your HDD when having Perf issues. Well, it worked like a charm, I defragged the System Drive fully, offline fully if you know what I mean. The result is what you see above. Interrupts now averages 0.5%. So there you go guys, maintain your spinning HDDs, it helps. Of course this solution will not/should not apply to SSDs, but unfortunately, those are also notorious to frags. But you should let Windows maintain SSDs as recommended by Microsoft. As you know they have limited Write life compared to traditional HDDs.